Morris, Peralta, Brun, van Duren, Bouma, & Perez-Llorens. 2008. Interaction between hydrodynamics and seagrass canopy structure: Spatially explicity effects on ammonium uptake rates. Limnology and Oceanography 53: 1531-1539. 明後日から10日間、沖縄はサンプリング。はじめて長崎丸にのりますが、研究のおための乗船ははじめてではない。ドクター時代、ヤップとウリシー諸島へ一ヶ月も乗船した経験がある。その時、初めて船にのったが、船酔いはしなかった。今回も船酔いしないとおもうが、どうでしょう。I will be going on field work this Sunday, for 10 days. It's not the first time I boarded a research vessel to do field work. That was when I was a PhD student and we went to Yap and Ulithi Atoll, which was about a 30-day cruise. I didn't get seasick during that expedition and I'm pretty sure that I won't get sick on this one either. It is about how E. coli gained the ability to metabolize citrate after a number of generations. 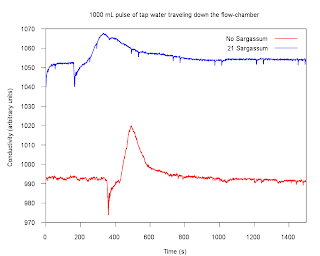 The is the data showing the conductivities in an empty flow-chamber (red) and when 21 individuals are placed within the working section (blue). Note the widening of the peak when the flow-chamber is not empty and the long tail. 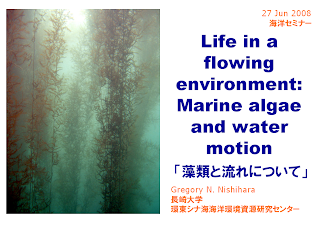 Clearly, the Sargassum are influencing the residence time of the the water within the flow-chamber, which suggests that the a portion of the water is "clinging" to the algae. 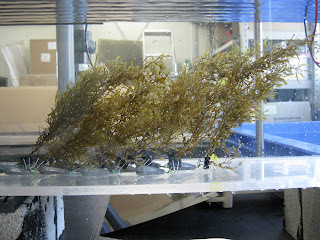 I just completed some experiments using Sargassum piluliferum as model organisms. I place 1 to 21 plants in the working section of the flow-chamber and used a Wenner electrode array to measure conductivity. Upstream of the moba, I poured 1000 mL of tap water into the flow, and watched it move through and around themoba. I was able to record the data at 5 Hz and am presently analyzing the data. With this, I plan to measure the residence time of the water, i.e., nutrients, within the moba.